When Chue Xiong and Ann Collid from the Eau Claire Area Hmong Assistance Association asked their community about what they wanted to do to improve the health of their community, the response was clear: more programs where elderly Hmong could interact and reconnect with their community. "Many elderly Hmong have not assimilated into Western culture, are very isolated, and experience a lot of depression and anxiety," said Chue, who conducted interviews with all of the participants before and after conducting this project. "All of the elderly people I talked to cried when I asked them about how many visitors they had a week and what their relationship with their family was like." Ann went on to explain that even though there was a community center, many of the elderly Hmong did not feel comfortable going there. Because the people they were trying to reach were isolated and many did not speak English, Chue and Ann designed "Hmong Elderly Programs" to include transportation and translators for all participants. One 103-year-old Hmong woman felt especially isolated before Chue and Ann met her. She was very eager to learn and was the second person to volunteer when the trainers asked them to practice calling the police, introducing themselves in English, and talking about what they needed. Now, 30 years after she moved to the United States and as a result of this project, she knows how to access emergency services. To leverage resources, they engaged student volunteers and built partnerships with community organizations that had the expertise that they needed. "It was a win-win situation," Chue explained. "We needed their help, and they needed the service hours." The only drawback was that many elderly Hmong would not accept rides unless they had met the volunteers beforehand. Chue explained that it would have been helpful to have a bus that the elderly Hmong could recognize. These workshops, capped at 20 participants each, focused on introducing small changes that were practical, culturally appropriate, and relevant to the elderly Hmong. "We wanted to work with what they actually had and teach them the benefits of being healthier," said Chue. During one workshop, the trainers cooked white and brown rice, allowed participants to taste test both kinds of rice, and taught them about the benefits of eating brown rice instead of white rice. To make the training more fun, they bought a bag of brown rice and gave it away as a door prize. To ensure that their workshops were relevant, Chue and Ann asked participants three questions: "What did you like? "; "What do you need? "; and "What would you like us to change?" Knowing that it was customary to be polite and say that everything was great, Chue always tried to pay attention to the participants' body language in addition to what they said. Their workshop on blood pressure, for example, was much too complicated for the elderly Hmong to understand, but the trainers would not have known this from just asking the participants. They had to pay attention to body cues and facial expressions as well. Now that the grant period is complete, Ann and Chue can proudly say that their project made a difference in the lives of the elderly Hmong in their community. "We knew what worked but did not have the funds to try this out. This gave us the opportunity to demonstrate how effective these programs can be," said Ann. "It is heart-warming to see the elderly Hmong get used to the space, build their own community, and feel welcome here." 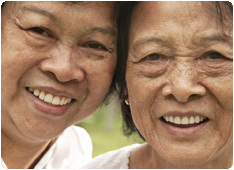 As one participant put it, "The Hmong Elderly Program is something that I look forward to every month!" Chue and Ann's efforts to be in tune with the needs of their community, build strong partnerships, and develop culturally competent trainings that focus on small changes have truly paid off. "There were hardly any tears when I interviewed the elderly Hmong after our workshops," said Chue. The elderly Hmong, once isolated and depressed, now feel much more connected to their community and comfortable with attending workshops that are designed specifically to meet their needs.